So, this week The Tories announced plans to make GPs provide appointments from 8am to 8pm, 7 days a week. This was clearly a combination of populism and an attempt to revive Labour’s 9-year-old changes to GP contracts as the cause of the drastic increases in Accident & Emergency (A&E) waiting times under this government. But it was much more than that. That blaming GP contracts for the steepling A&E problems is complete nonsense has already been shown on this blog and elsewhere. But the government knows that most of the media have consistently supported its misrepresentation of the A&E issue, so it’s trying to turn a proper narrative in which the government’s continual squeeze on NHS resources is causing the whole system to strain at the seams into one where the government rides in to herd those naughty GPs whose easy contracts are at the root of the NHS’ ills into providing the service that they should have been all along. Distraction, in other words. A big red herring, and a smelly one at that. But the plan goes further. If you can say one thing for the Conservatives, it’s that they’re ambitious when it comes to their banditry. The plan to force GPs to provide care from 8am to 8pm will, in effect, prevent new GPs from setting up small starter practices – because one or two GPs can’t possibly realistically provide appointments for 12 hours a day, 7 days a week, on an ongoing basis. Far from promoting good, continuous, personal care, the requirement to provide this extended cover will have the effect of commoditising GP care. Individual GPs will have little hope of setting up a practice, and many existing smaller practices will be forced to amalgamate, or else be bought by big companies who, wanting to maximise profits, will take on GPs on a salaried basis rather than as partners. This will create a ‘churn’ of GPs in large practices just like we see in any other business, as GPs seek better terms or are laid of in waves of cost-cutting measures – damaging the continuity and patients’ expectations of usually being treated by the same doctor, which the Tories claim to want to restore. Not so nice to see you.. The truth of the Tories’ motivations, and of the ultimate result of yet more ‘top-down’ changes that Cameron promised to end, is revealed by the proposals being put to worst-health-secretary-ever Jeremy Hunt by ‘senior members of Conservative Health’ (a Tory health think-tank). These proposals outline a plan to end current links between GPs’ earnings and the patient outcomes they achieve – and to replace them with a system that pays GPs according to how many people they see, relative to how many people are on their list. Practices who provide good care provide more face to face time with patients. We could pay practices who have higher numbers of appointments for the number of patients on their list. Which is, of course, exactly what would end up happening. GPs are only human, and in the end you get what you pay for. If you doubt whether this would happen, you only need to look at the impact of the ‘four-hour target’ (FHT) in A&E departments. Patient groups and healthcare professionals alike have identified the negative implications of the pressure to get people through A&E in four hours or less because hospitals are penalised if they don’t achieve the target. Nurses have been struck off for shunting patients around and using other ‘dodges’ to make it appear as if the FHT is being met when it isn’t. But it’s only human nature to feel pressure to cut corners to meet demanding targets if you face censure for failing – and inevitably, some will succumb to that pressure, to everyone’s detriment. And, irony of ironies, the Tories are of course doing what they have only recently condemned. The Tories know that the public doesn’t trust them with the NHS – and it has led to some desperate attempts to smear the Labour party’s NHS record, such as the orchestrated attempt to claim that 14 NHS hospitals allowed 13,000 patients to die unnecessarily – and the subsequent attempt to manipulate Shadow Health Secretary Andy Burnham into resigning. I welcome Sir Bruce Keogh’s important report. However, although I admire my right hon. Friend [Jeremy Hunt], I totally dissociate myself from his ill-judged attempt to drag this important issue into the gutter of partisan politics and petty point-scoring. But the Tories plainly hoped that, in the minds of the uninformed and with the collaboration of the right-wing press, enough mud would stick. The hypocrisy is no less in this latest instance. Having condemned the supposed ‘target-driven culture’ of the NHS and the supposed lack of compassion it led to, when it suited them, the Tories are now seeking to impose targets not only for how long GP surgeries have to remain open, but also how many patients they see. 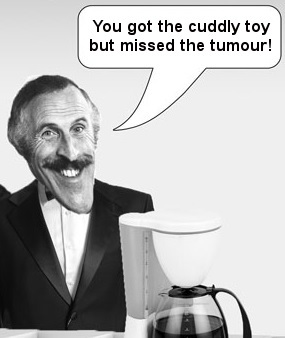 By paying according to how many patients they see in a day, the Conservatives are encouraging an intensely-damaging ‘throughput culture’ in which patients will basically be on a conveyor belt – like Bruce Forsyth’s old show, The Generation Game. And, just like used to happen on the show, the short exposure will lead to things being missed. On the show, that simply meant contestants going home with fewer prizes – but in a medical setting, that pressure to achieve this ‘throughput target’ will mean missed symptoms and – genuinely, this time – avoidable deaths. These two elements together – an increasing absorption of GP practices by large, profit-driven groups and the linkage of remuneration to throughput – will be a truly toxic mix for patients and healthcare professionals alike. But they will mean bigger profits for the private healthcare companies who have consistently channelled funds into Tory party coffers – so at least they’ll be happy. I’ve said often that the Tory party just can’t help itself – ‘by their deeds you shall know them’. The Tories have a lot of allies in greed, and their PR machine is pretty slick at keeping their actions and motives obscured from the voting public. But their greed is so great, and their desire to make the most of this period in office so overwhelming, that they always overreach themselves and make it obvious what they’re really doing, and why, to anyone who looks and thinks. So they’re desperately hoping that people won’t do either. Let’s spread the word and disappoint them. The tories are blaming labour for all the problems they caused poor nutrition = outsourcing catering, dirty hospitals = outsourcing cleaning and laundry services False claims about care (drinking from non existent vases) = denigrating good hospitals NHS is safe in our hands = were going to privatise it. We have got 50 000 of benefits and back into work = ATOS wrongly place 50000 people on to the Work related group of ESA and their 1 year has expired before ATOS has dealt with their appeals. Surely another side effect would be that GP practices would be incentivised to get the healthier, seen less often, patients of the books till eventually the only people on them would be chronic or repeat visit patients. This would mean an huge increase in non gp’d patients whose only method of health care should they become ill would be to turn up at A&E which would make the whole problem far worse… Then they can outsource/create a whole new level of “GP’s” walk in clinics, to alleviate the problems cause by the reduced numbers of A&E’s departments, who can walk away with huge sums of moola from the tax payers or offer quicker services “same day” appointments for a modest private fee… Kerching! The problem before the NHS was, of course, access to healthcare. This was solved by 1) free at the point of need and contribution on a continuous basis when well according to means, 2) everyone having a GP nearby to advise and signpost to secondary services if required and 3) the district hospitals (bringing secondary care near enough to access in an emergency and on the advice of your GP if less urgent. If you have a “stand on your own two feet” “pay for what you get” “poll tax was a good idea” “public services is daylight robbery” ethos then the response is 1) privatise generally (in preparation for an insurance based system), 2) polyclinic-ise General Practice (in preparation for privatisation) and 3) get rid of DGHs either by merger (merger=closure if you are the smaller of the “partners”) or some sort of spurious “administration” after you have rigged the system of payments against them to suggest “unaffordability”. The point is this – if you don’t even attempt to have equity of access to health services, you don’t have an NHS. Thanks again Steve, for looking behind the policy – it’s usually ugly.